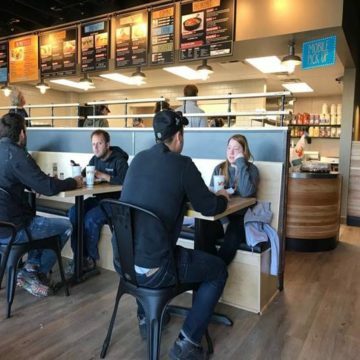 Grand Forks, ND, October 19th , 2017 – Denver based Smiling Moose Rocky Mountain Deli, is celebrating its newest location in Grand Forks, ND, which opened on October 16th, 2017. Located at the corner of Demers Avenue & Washington Street, this will be the fifth location in North Dakota. Smiling Moose, a fresh, fast-casual franchise, is known for their award-winning sandwiches, like the Original Mo!, a unique twist on New York’s classic ‘chopped cheese’ sandwich. With four other North Dakota locations, this new Smiling Moose restaurant will provide Grand Forks residents with a bold flavor experience complete with hearty portions that are made-to-order using premium house-made ingredients. Guests can enjoy handcrafted assortments that range from irresistibly messy hot sandwiches (served with a fork), custom-chopped salads and mouthwatering cold sandwiches, savory soups, wraps and fresh baked cookies… not to mention, piping hot breakfast sandwiches and skillets are served all day, every day. Smiling Moose is proud to feature adventurous house-made sauces, like their zesty lemon pesto aioli and signature cranberry chipotle mayo. Owners Nathan Everson and Liza McLean, both North Dakota natives, have established their “Moose Herd” throughout Williston, Watford City, Fargo and Eau Claire, Wisconsin, and are thrilled to have brought the Smiling Moose experience to Grand Forks. According to Everson, “Grand Forks is the perfect location for the Moose because of its flourishing population of hard-working, fun-loving, outdoor enthusiasts who will fall in love with our unique and flavorful food that is as adventurous as they are!” Smiling Moose president, Rich Eisenberg, boasts that Everson and McLean are ideal world-class operators for the Smiling Moose Brand. He went on to state, “Both Nate and Liza have established an excellent management team focused on ensuring that every guest has a true “Moose” experience that leaves them smiling. They are an excellent example of the type of multi-unit Franchisees we are looking for as we begin our expansive growth throughout the country. We couldn’t be more excited to have yet another great location open in North Dakota!” Along with the core menu items, Smiling Moose offers flavorful vegetarian and gluten-friendly options to fulfill every guest’s dietary needs and taste preferences, as well as a variety of kids’ meal options. Guests can also skip the line by ordering on their phone using the popular Smiling Moose app. In addition, Grand Forks’ businesses will be thrilled with customizable catering options covering breakfast, lunch and dinner as well as large off-site events. Be warned, the Moose is on the loose in Grand Forks! Founded in the mountains of Colorado in 2003, Smiling Moose Rocky Mountain Deli is an innovative concept, with 15 locations in 7 states, serving the fresh quality and flavor of a deli with a happy smile. Serious about offering creative hand-crafted sandwiches, wraps, salads, homemade soups, fresh-baked cookies and more, Smiling Moose isn’t a secret, but for everyone who finds them it’s a welcome discovery. An originator of fast-casual all-day breakfast, Smiling Moose offers craveable breakfast sandwiches, burritos and skillets. Enjoy delicious, Rocky Mountain deli-style food served fresh with a side of fun! Smiling Moose Rocky Mountain Deli was recently acquired by Rightway Brands, Inc., and Rich Eisenberg, co-founder of QSR International, which conducts restaurant business in 16 countries. For further information, visit www.SmilingMoose.com.